Kasia Roether, originally from Poland, has been working with horses and people, in the US, for the last 15 years. Her extensive knowledge and understanding of equine behavior guided her work towards helping people through the use of horses. 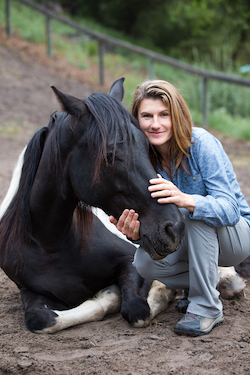 Kasia started her journey of healing with horses as a certified therapeutic riding instructor. Incredible sessions with all kinds of students have continuously proven that horses can profoundly improve human lives on many different levels. While deepening her equine experience, Kasia collaborated with other programs using horses for therapy and counseling, such as: EAGALA, Tao of Equus, Morning Star Youth Ranch, programs for veterans and life coaching facilitated by Koelle Simpson and Martha Beck. The joy and satisfaction that resulted from those connections naturally led her to purse life coaching facilitated by equine activities. Living in Atascadero, California, besides being involved with education at Koelle Institute, Kasia offers individual and group Equus Coaching, horsemanship and equine training sessions, and works with other coaches and horse owners all over the US and the world.